Over ten years and seven long players into their career, White Denim are still in the relentless pursuit of a thread- in other words, a wick. The band have carefully studied the greatest records ever made, but they write songs just dumb enough to drink, dance, and fight to. Theirs is a music that aims for the whole body, while equally satisfying the mind. While it has morphed, expanded, and even burst apart, White Denim’s sincere and human drive and ability to spark exhilaration have been unerring constants of the band’s existence. Now, two years on from their comeback album supreme Stiff, singer-guitarist James Petralli and bassist Steve Terebecki have changed tack again for their seventh full-length, Performance. A new studio, new collaborators, and new techniques for writing and recording influenced the elastic possibility and liberation felt throughout. The band’s new studio in downtown Austin is called Radio Milk. Once an old general store constructed in 1902, it is now respectfully restored and sandwiched in between bars and modern condominiums. When White Denim were recording, they’d have people stopping by expecting the place to be another bar or curio shoppe. They’d sometimes knock on the door to ask what was going on or simply stand staring in from the sidewalk. They’ve since built a fence for privacy, but initially, it was “a sort of low lit secret place, but people could clearly see everything going on inside. We have since purchased curtains, but at first it felt like a bizarre sort of stage or a Petri dish.” Petralli laughs. Performance was mainly recorded over eight weeks. Two new players were key in what Petralli describes as “a super-collaborative record”: keyboardist Michael Hunter, a “young, humble genius with endless potential” and Conrad Choucroun, a “ridiculously solid” drummer with a long stint with NRBQ on his resume. “If you take nothing else from this at least take some time to listen to NRBQ, rock & roll scholars who shared members with the the Sun Ra Arkestra” advises Petralli. 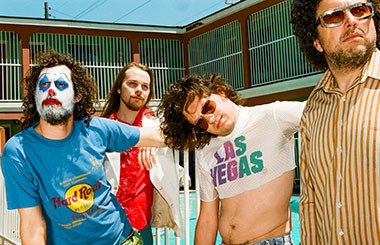 It makes sense that White Denim would develop a kinship with a player from their circle. In many ways, they are a continuation of that sort of group. One that will never stop pushing and taking every opportunity to shine a light on and exemplify what is truly good about Rock & Roll music. Categorically speaking, White Denim is still impossible to narrowly pin down. There’s the glam-rock strut of “Magazin” and “It Might Get Dark”, the dueling guitars on the low-slung blues prog of “Moves On”, and the sideways jazz of “Sky Beaming”. There are plenty of pleasingly unexpected ear snags on the title track and the easy-rolling closer “Good News”. In the title track “Performance” Petralli sings, “Flashing light in a tunnel, You’re indicating a change”. In many ways, White Denim is a flashing light in a dark and crowded tunnel of showbiz glop, fervidly finding themselves and us through their work. – 50c per ticket service charge applies on phone, internet or credit card bookings. Final ticket price may be higher from other outlets. Whelan’s Indie DJ in the bar and Sonntags [Disco/House/Funk] upstairs from 11pm til late (Free Entry).